When Jeremy Lin returned to Madison Square Garden wearing Houston Rockets red for the first time last season, he did so amid early-season struggles to find both rhythm and role alongside new backcourt partner James Harden, a ball-dominating star in the making whose ascendance relegated Lin to an off-the-ball, spot-up-shooting assignment for which he seemed ill-suited. Upon returning to the court where he became an international superstar and sensation, though, Lin quickly resumed playing like one, breezing his way to 22 points on 15 shots, eight assists, four rebounds and a pair of steals as the Rockets mopped the World's Most Famous Arena's floor with the New York Knicks, the team that gave him a chance to shine and then declined to bring him back as a restricted free agent for ... um ... reasons. In a season marked by peaks and valleys, that Dec. 17, 2012, performance was an unquestioned high point, a homecoming worth celebrating and a reminder that, while his first season in Texas might not always go the way he'd hoped, he could still call on the kind of game that breaks down defenses and brings crowds to their feet ... or, as was the case in the Garden that December night, hushes them up right quick. The situation's a little bit different this time around as Lin's Rockets head to Manhattan for a nationally televised Thursday night matchup with Carmelo Anthony and the Knicks. A year has passed, and each side has moved on in its own way. Lin went through the bumps and bruises expected of a first-year starter handed full-time minutes, and while he wasn't often the lightning bolt of February 2012, he earned his keep and showed signs of a brighter tomorrow. The Knicks, for their part, had their best season in more than a decade, while the Harden-Lin-Chandler Parsons Rockets became fast-paced people's champions. Both teams made the playoffs, both teams bowed out early, and both teams added new big guys this summer. (One was more highly touted than the other.) This season, Houston's on the right side of .500 and New York isn't, but the Rockets enter MSG coming off an overtime loss to the upstart Philadelphia 76ers, while the Knicks hung on for an owner-guarantee-validating road win over the Atlanta Hawks. Houston's trying to figure out how to manage the Dwight Howard-Omer Asik frontcourt and get deal with Howard's ongoing sucking-at-free-throws; New York's trying to stay afloat without Tyson Chandler and figure out how to fill the gaping hole in the middle of their defense. Yeah. Good luck with that, Jeremy. To be frank, reducing Lin to a subplot would do him a disservice at the moment, because the 25-year-old guard's been playing excellent ball for Kevin McHale's squad. Lin's averaging 18.1 points per game on blistering shooting marks (54.2 percent from the floor and 51.4 percent from 3-point range, tied for 12th-best in the NBA) while chipping in just under five assists, 2 1/2 rebounds and two total blocks/steals a night. 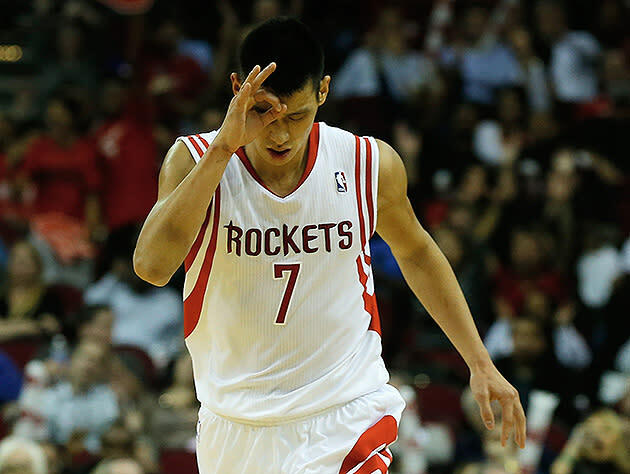 He responded to being bumped from the Rockets' starting lineup in favor of the more defensive-minded Patrick Beverley by maximizing his opportunity to be Houston's primary second-unit scoring option (a role my colleague Eric Freeman has long argued might be Lin's best fit), and playing an aggressive, attacking brand of basketball — he's getting to the foul line nearly six times per 36 minutes, a giant leap over last season and nearing the frequency he managed during the 2011-12 Linsanity season. Lin's comfort with, and success in, this role has made him a measurable force on the floor; Houston's outscoring opponents by six points per 100 possessions when he's on the floor, and getting outscored by 1.4 points-per-100 when he's sitting, according to NBA.com's stat tool. And when he's had to play without Harden — as he did on Wednesday, when the All-Star sat with a sore foot that could also keep him out Thursday — Lin's stepped up to the plate, averaging 24 points and eight assists on 47.4 percent shooting and a 58.6 percent mark from downtown, according to Rockets blog ClutchFans. “It’s not like just because you start you’re going to finish,” Lin said. “I think last year I started and there were plenty of games I didn’t finish. That’s just part of the game. In terms of finishing the game, I didn’t think starting versus not starting would determine that. “I think it’s good. Every game I learn a little more. In terms of my approach, I’m not trying to change too much. I’m trying to keep playing and be aggressive. Everything else will take care of itself." It's certainly been taking care of itself to this point in the young season. If a Knicks defense that has struggled to both prevent dribble penetration and deter shooters at the rim isn't careful, it could lead to another big-time night on Broadway for one of the Garden's stage most illustrious recent performers.